Some people are great at advising others and helping them reach their potential. For some this wouldn’t be a fitting lifestyle, since having to give advice too much would seem a bit draining. 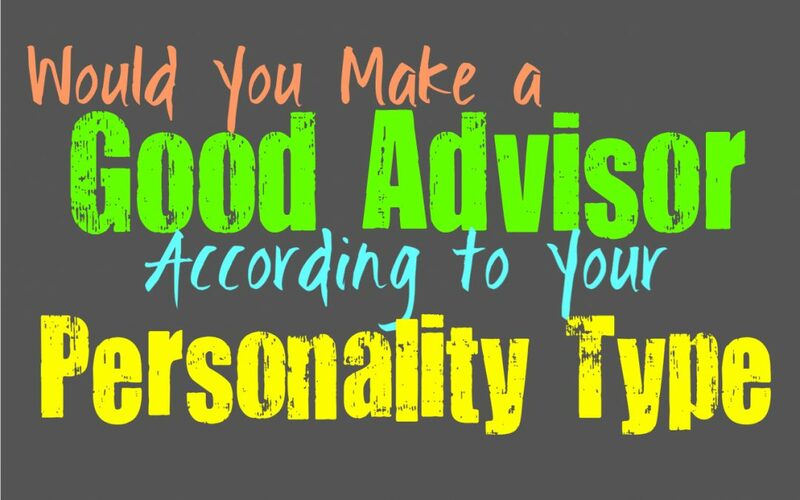 Here is how good you would be as an advisor, based on your personality type. INFJs make for amazing advisors since they have a strong intuitive sense of things. Their ability to understand people and connect with the future, is certainly useful in this position. They enjoy being able to help people, especially if it pushed them towards a better life for themselves. INFJs can often make for good advisors to people because it is often a more behind scenes and doesn’t require them to be in the spotlight. INFJs can sometimes struggle to act on their own intuition, and so being an advisor is actually quite perfect for them. ENFJs can certainly make for good advisors, especially to people who are open and will actually listen to them. They enjoy being able to help people and give them advice which could actually improve their future. They are intuitive people who can often have a strong sense of future outcomes, this is something which helps them immensely with being advisors. For the ENFJ the pressure can be a bit challenging sometimes, since they don’t like letting people down. At the same time they are very driven people who are capable of overcoming just about anything. INFPs don’t often enjoy being advisors in a more serious capacity, since it can be a lot of pressure and stress on their shoulders. They want to be able to show their support and are willing to give advice to their friends, but anything on a larger scale would be a bit overwhelming for them. The INFPs advice is often heavily weighted in their own beliefs and inner morals, which isn’t always something a person searches for when it comes to a business advisor. While INFPs can certainly help be the moral compass for their loved ones, being an advisor isn’t necessarily something they would desire. ENFPs enjoy being able to give advice and help people out, but that doesn’t mean they would seek out a career as an advisor. This type of situation can feel a bit overwhelming for the ENFP, and they rarely want that kind of pressure on their shoulders. They enjoy helping others and definitely want to show their support for their loved ones as best they can. ENFPs can often give great advice and are rather helpful for their loved ones, but they really aren’t fans of having to be an advisor to someone. INTJs are definitely good advisors, but most of the time they prefer to take care of their own business. In some situations it can be rewarding for them though, since they can advise without having to be in the spotlight. They are excellent at giving the right advice which will actually help someone improve their situation and move forward in the right direction. They have a strong sense of the future and how to bring about the results they desire, which certainly makes them useful advisors. ENTJs are often great at giving advice and can certainly help someone move towards the right direction. They have a strong sense of direction and often work hard to accomplish their goals. While ENTJs are more focused on action and getting things done themselves, that doesn’t mean they cannot be great advisors. ENTJs are capable of seeing the best path to take and this often helps them push others in the right direction and give them the best possible guidance. INTPs often make for amazing advisors, since they aren’t fans of having to be in the spotlight themselves. INTPs also don’t always prefer to take action and can lack the motivation to really keep moving with most things. What they can definitely succeed at is giving a sense of direction for others and using their minds to help them make a better life for themselves. They can make for especially great advisors to people in higher or truly important positions in life. ENTPs can certainly give good advice to others, but having to do this constantly might not be what they are looking for. They often prefer to live their own lives and so having to be behind the scenes isn’t really right for them. ENTPs can certainly give advice and work in a job where they give information to others, but they also need to space to take action in their own lives as well. They can sometimes be more interested in their independence, and so being an advisor would likely get boring after a while. ISTJs are definitely good advisors and are useful at assisting others. ISTJs are practical and logical people who are good at getting things done. They are often capable of advising people towards the best future and the direction which will be most beneficial for their lives. ISTJs are capable of helping people gain a sense of motivation and know what they should be doing with their lives. While they are good advisors they can become a bit drained by having to help people who don’t really listen all that well. ESTJs can be good at advisors but they prefer to take care of their own business. Having to advise others and help them figure out their futures can feel like a waste after a while. While they don’t mind helping their loved ones, ESTJs prefer to get things done themselves. They value efficiency and work hard to build a future for themselves and their loved ones. For them having to be someone else’s advisor can feel like they are wasting their own abilities. ISFJs can often help people when it comes to their emotions crisis, but other than that they might struggle to really be advisors. They are willing to help and inspire their loved ones but having to constantly advise people can feel like too much pressure. ISFJs simply want to be able to tend to the needs of those around them and focus on doing what they believe is right. While these are the more important things for them, they don’t often enjoy being the advisor for someone else. ESFJs believe in taking care of their loved ones and helping them improve their lives. While they are capable of giving helpful emotional advice, they often prefer to do this on a smaller scale. They can become a bit drained by the pressure of being the advisor for those around them, since if they make a mistake this can seriously cost someone they care for. ESFJs might enjoy being an advisor in some ways, but mostly in a more emotional sense. ISTPs can definitely make for good advisors since they are logical and practical people. They enjoy helping others learn and grow, but having to deal with this constantly might be draining. While ISTPs would likely be great advisors, it isn’t necessarily a career they would be happy with. Having to constantly deal with people and helping them make the right choices, would definitely be draining for them after a while. ESTPs can give information freely and are very factual people, but having to be someone’s advisor isn’t really their style. They want to be able to give their opinions and share information, but doing it in a more long term way is a bit too much. ESTPs don’t like feeling as if they are in control of someone else’s lives or their choices, since this can be a bit intense for them. They enjoy helping out and spreading the truth, but only on their own free time. ISFPs don’t like having to be an advisor, since this job feels a bit overwhelming for them. While they can give advice to their loved ones this comes from a moral and personal place. They can certainly be someone’s moral compass and enjoy helping people seek out joy in their lives. But being an advisor in a larger and more serious capacity, just isn’t the type of career ISFPs would be happy or comfortable pursuing. ESFPs really aren’t fans of being advisors, since this can feel like too much pressure. They enjoy being able to help their loved ones but being their advisors just doesn’t often feel right for them. They want to live their lives with a sense of freedom and openness. Instead of having to constantly feel responsible for everyone else’s choices, ESFPs want to give people the space to make their own mistakes and follow their own path in life.